Do you have customers who like to tweak patterns and make them their own? Do you have customers who want to get out of their color and design ruts? Do you have customers who want a process and technique class on occasion (rather than another project workshop)? If the answer to any of these questions is YES, then it’s Creative Quilt Challenges by Pat Pease and Wendy Hill to the rescue! • Plan a conventional 1-3 Day workshop using the challenge themes found in the book to elicit one (or more) responses to the themes. • Start a Take the Challenge Workshop Series with a workshop once a month. Entice your customers to join your ongoing series and become a Challenge Club member. Plan 1 workshop per month. A mix of teachers, depending upon their areas of expertise. Encourage smaller quilt explorations. A small size (such as 20” by 20”) lets students try out things without a heavy time or financial commitment. Special Techniques: Encourage the workshop teacher to highlight one or more of our special techniques with each workshop. It’s a bonus! Take the Challenge Club Display: set aside some wall space for finished (or in progress) pieces. Put up some signs and let the fun begin! • Continue to offer the Take the Challenge Workshop Series all year around. • Create a Take the Challenge Passport for new and returning students (who want to continue discovering their style and building their color & design skills). • Offer bonus prizes and Challenge Club badges throughout the year. You decide how students can earn badges and win bonus prizes. • Invent your own themes to mix in with the book challenges. • This is a process workshop and students shouldn’t be rushed. Students need time to gain insights. Encourage students to think of their creations as explorations, not masterpieces. 1. Students think about and describe what they literally observe. 2. Next, students go beyond this to ask questions about what makes this creation “tick”. Go into more depth about color schemes, value and design elements. 3. Now students can start to interpret the creation by thinking about intention, motivation, or purpose of the maker. Including the maker in the conversation adds depth to the insights. Class Supplies: Add basic sewing notions, sewing machine, and so on. 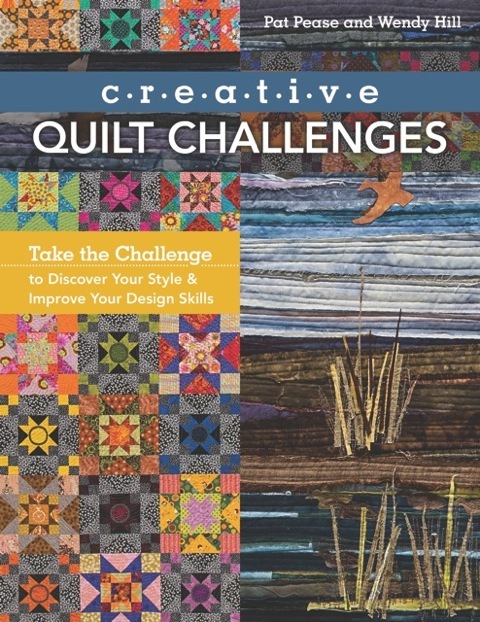 • Creative Quilt Challenges, Take the Challenge to Discover Your Style & Improve Your Design Skills by Pat Pease and Wendy Hill. A) Scraps, leftovers, assorted fabrics in a wide range of values, styles, colors, visual & physical textures work well with these themes: Reimagine an Old Block with a New Twist, The Value of Value, Pass It Back and Forth, Invent Your Own Challenge. * Unlikely Materials: hair interfacing, mop strings, burlap, netting, silk, etc. * Mix It Up: This is a good opportunity to use mixed media materials (fabric paint, stenciling, paint sticks, embellishments, etc). It might be easier to provide materials to share with a reasonable materials fee. 1) Have students “start something”. The maker writes their name at the top of the back. 2) Pass the “something” right or left (or draw from a bag). This maker adds or subtracts to the “something” and adds their name on the back (under the first name). 3) Continue to pass or exchange the “something” several times, then go through a “reflection” process (with creations on the wall). The creation returns to the first person. 1) Have students work in pairs or small groups of 3 to 5 people, which is less intimidating for some people. 2) The pair or small groups exchange the “something” as above. 3) The “reflection” takes place in the pairs or small groups.